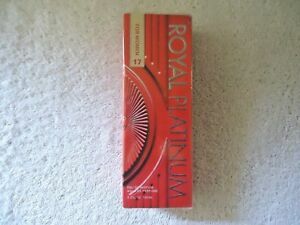 " NOS " NIB " Royal Platinum 71 For Women Perfume 3.3 Fl.OZ. " GREAT GIFT "
Royal Platinum 71 For Women Perfume 3.3 Fl.OZ. "GREAT GIFT." Details about " NOS " NIB " Royal Platinum 17 For Women Perfume 3.3 Fl.OZ. " GREAT GIFT "
" NOS " NIB " Royal Platinum 17 For Women Perfume 3.3 Fl.OZ. " GREAT GIFT "
Hawaiian Moon Aloe Cream Skin Moisturizer - 9 oz Jar - Full Size - New & Sealed! This item(s) is being SOLD AS IS.Thank You.